Coravin is a market leader in ‘Wine Preservation Systems’. Or, to put it more simply: the company makes wine openers that keep your bottle tasting fresh, longer. Instead of removing the cork, the patented Coravin technology keeps the cork in place and sealed. A thin needle pierces the cork, whilst the bottle is pressurized with argon gas to ensure no gas escapes. The devices create an airtight seal, letting no air in or out – and ensuring your wine is preserved perfectly. 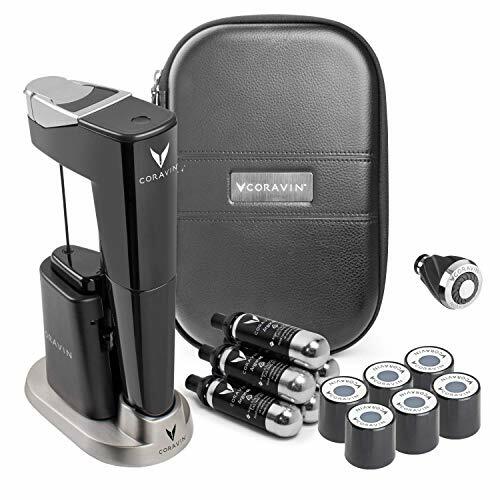 If you’re a true wine enthusiast, a Coravin Wine Preservation System is your ultimate accessory. Yes, we’ll admit: these products are quite expensive. But we can assure you: it will change your (wine) life! If you’re prone to throw away bottles because you can’t finish them in time, or simply want to alternate between wines, this is the perfect solution. See it as an investment for your long-terming drinking pleasure. 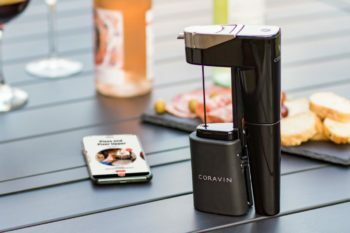 At ilovewine.com we’ve created an in-depth Coravin feature on the company’s story, its state-of-the-art technology and the Best Coravin Products for every type of wine lifestyle. Coravin’s mission is to transform the way wine is served, sold and enjoyed. Its innovative wine systems are found in high-end restaurants and wineries; but also in the homes of wine enthusiasts. You simply don’t have to be a wine professional to enjoy Coravin’s professional wine products! The company invests heavily in research and development. And is a market leader in wine preservation systems. 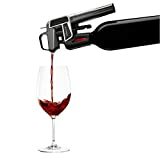 Its patented technology allows you to pour wine from a bottle, without removing the cork. This means you can have a glass one day, then have another from the same bottle a few weeks. Your wine is preserved longer, no risk of spoiling quickly. Coravin was founded by medical device inventor Greg Lambrecht. Lambrecht decided to combine his expertise in engineering and inventing with his passion for wine. The result: Coravin. He found a solution to enjoy a glass of wine, without having to commit to drinking the full bottle. Lambrecht wholeheartedly dedicated himself to creating the best product possible. Years of research, testing and further improving his invention followed. Finally, Lambrecht was fully satisfied with the quality and functionality: Coravin was launched. Today, Coravin is a renowned name in wine preservation systems. A thriving company located in Burlington, Massachusetts, it has taken the wine world by storm. 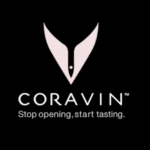 Coravin has a curated assortment of products. Each with their own unique skills and wine thrills. All amazing at extending your drinking pleasure. Coravin has 4 distinct models. Each of these is available in multiple specifications, luxury editions, and colors. The models are the Model One, Model Two, Model Two Elite and Model Eleven. The original Coravin Wine Preserver System, Model One, is the most affordable. Prices go up the more add-ons you want. Add-on options include additional argon capsules, needles or storage cases etc. 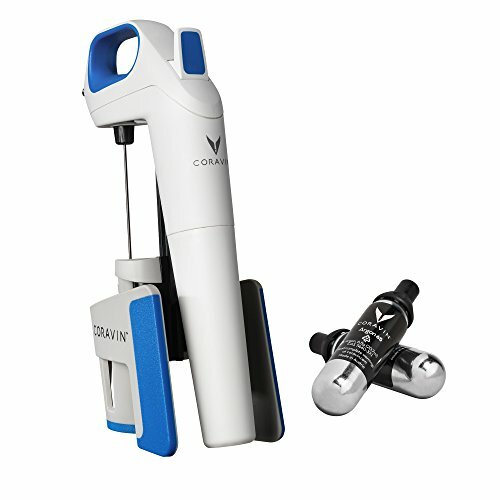 The most luxurious model, the Coravin Limited Edition II Bundle Starry Night, is at the top end of the budget. Making this the ultimate indulgence in Coravin’s premium assortment. This beauty has been my personal wish-list for a while, so let’s hope my husband takes note! A Coravin Wine Preservation System is actually very easy to use. This ingenious method allows the cork to reseal naturally. Your wine will be protected for weeks, months – sometimes even years – depending on the grape variety. The Model One is the original, best-selling Coravin wine preservation system. Though the model is the most simple of the Coravin products, it is by no means a basic design. In fact, this model has all the innovative functionality you need. Pour yourself a glass of wine, within seconds, without removing the cork. The state-of-the-art wine Model One will reseal the cork and preserve your wine for long-term enjoyment. No need to commit to drinking the whole bottle! The Coravin Model One is easy to use in just a few simple steps. The device comes with special soft-touch grips allowing for easy, comfortable handling. Its ‘load cell technology’ creates the perfect amount of force to create an airtight seal after pouring. The design comes with 2 argon gas capsules included, which pressurize the bottle to ensure no gas escapes. 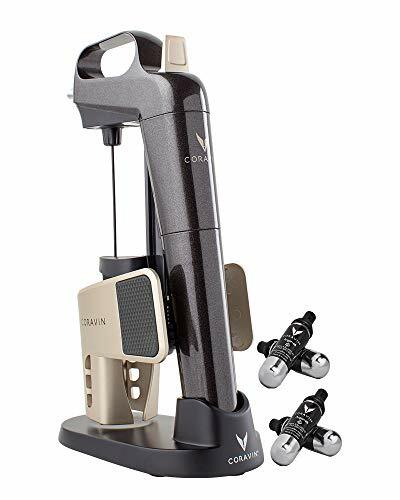 As the most affordable model in the Coravin collection, the Model One does have the Coravin patented technology and functionality. However, if you want additional functions and accessories, such as automatic pour, a LED display, a storage case or base, look for one of the high-end models in the Coravin selection. That being said: the Coravin Model One definitely covers the needs of the amateur wine enthusiast. If you want to keep your wine tasting fresh, longer (and don’t want to blow your entire budget): this device absolutely does the trick! The Coravin Model Two Wine Preservation System is an upgrade from the original, best-selling number Model One. This elegant design features the same patented technology as its predecessor, but also boasts some additional perks. What is different? Well, for starters, the Model Two simply has more style. A classic, dark silhouette is enhanced with contemporary chrome accents. The contrast between the two gives this quality design an instant sense of luxury. Making it not great in function, but also a great to look at. We’d place it prominently in a bar area or in a kitchen display. This eye-catcher deserves to be seen! In addition to a different color and look, the Model Two upgraded from soft-touch grips to rubberized grips with chrome clasps. More comfortable to squeeze; and more durable for long-term usage. The Model Two also comes with 2 argon capsules included. If you want a Coravin Wine Preservation System that not only does the job, but also looks the part: the stylish Model Two might be your perfect match. 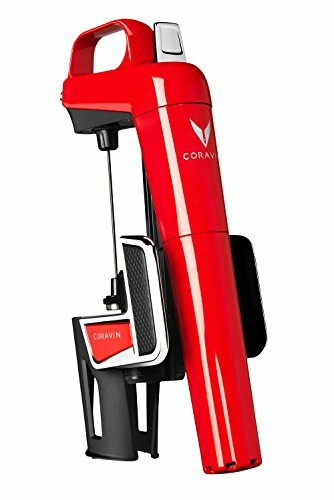 The Coravin Model Two Elite Wine Preservation System is an upgrade on the popular Model Two. The Model Two Elite is just a tad more expensive, making it an affordable step-up from the standard model. The big difference with the original Model Two is that the Elite is available in 3 trendy colors: vibrant red, glamorous gold or sleek silver. Each color is complemented by high-end chrome accents. Match your favorite hue with your own design aesthetic and enjoy your wine in style! The Model Two Elite’s thin wall needle also pour 20% faster than the basic Model One’s original needle. The Model Two Elite’s proper-fit clamp is easy to open and close, tightly securing your bottle in place. Comfortable to handle, striking in color and extra fast in action: the Model Two Elite is a vibrantly hued must-have in every wine lover’s collection. The Coravin Model Two Elite Pro Wine Preservation System is the most luxurious amongst the Model Two series. Available in a variety of colors inspired by luxury, its a trendy and classy addition to your wine accessories collection. The Model Two Elite Pro is a perfect match for those that want maximum functionality and maximum luxury. Its functions are the same as the Model Two Elite, but the Pro also comes with fancy Coravin add-ons. In contrast to the Model Two and Model Two Elite, the Model Two Elite Pro comes with 4 argon capsules included, instead of 2. This extra deluxe edition also includes a premium carry case and handy storage base. The durable, stylish carry case is soft-lined and protective: ideal if you want to bring your Coravin System with you on the road. It is spacious enough to store one Coravin system and 2 Coravin capsules. This fully enables you to take the ‘by the glass’ experience with you, anywhere you go! Dinner party or wine tasting at a friends house? Share the ease and comfort of your Coravin system with them! The handy storage base, also included with the Model Two Elite Pro, is made of quality zinc. This ergonomic base allows you to securely store your Coravin system. A classic, matte black finish matches it with any decor; instantly adding a touch of style anywhere you place it. The Coravin Model Two Limited Edition Starry Night is an ultra-exclusive wine experience. This limited edition release is ‘inspired by the depth and brilliance of a summer night,’ Coravin describes. This wine preservation system comes in a beautiful warm black and light gold color scheme and is a real statement piece. The Model Two Limited Edition Starry Night has the same specifications as the Model Two Elite Pro and comes with 4 argon capsules and a chic storage base. If you want something a bit more exclusive, yet still within the same price range as the standard Model Two: this is your match! The Coravin Model Eleven is the newest, and also most expensive, addition to the brand’s assortment. This new arrival is the most futuristic wine preservation system you’ll find on the market. Not only does it use Coravin’s patented technology, but it’s also Bluetooth connected and fully automatic! 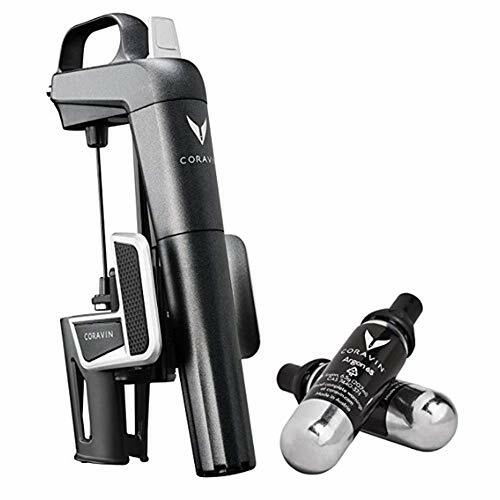 This state-of-the-art addition to the Coravin range makes preserving and pouring wine a breeze. The Model Eleven is easier, quicker and more functional than all its predecessors. If you want the most luxurious, high-end Coravin product available: the Model Eleven is it. How does it work? Simply insert the needle through the cork, tip your bottle, and the device will automatically pour your wine. The Model Eleven has a stylish LED display with intuitive icons that will alert you when to charge the system or replace an argon capsule. The premium design even allows you to optimize your argon gas usage. You can alternating pouring sizes, optimizing usage, by simply pressing a button. You’ll also know when you’re good to pour when the light ring changes color from blue to green: signaling the device is fully engaged. The futuristic fun doesn’t stop there. 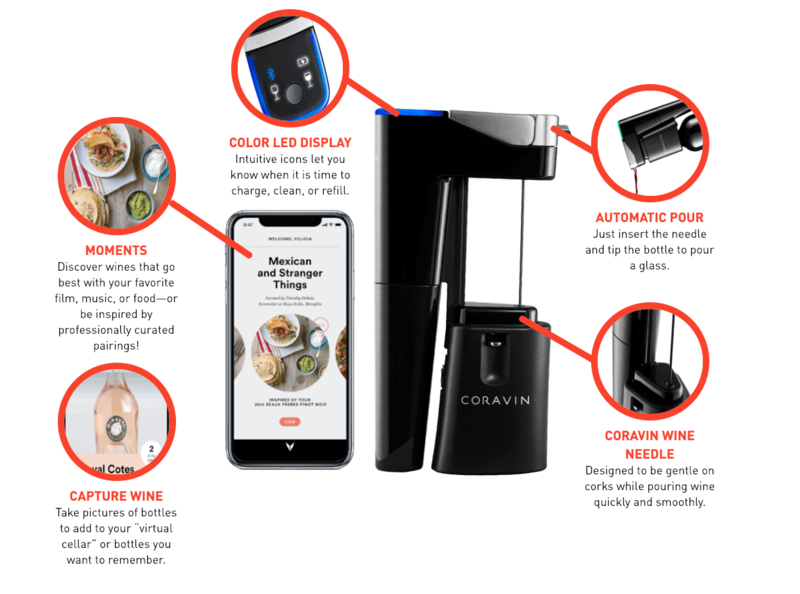 The Model Eleven even connects with a Coravin Moments Mobile App. 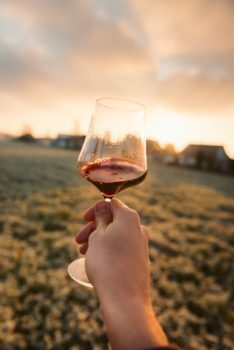 This app lets you check your statistics and create unique wine experiences with food and music. This isn’t a mere state-of-the-art wine preservation system: the Model Eleven is a lifestyle! 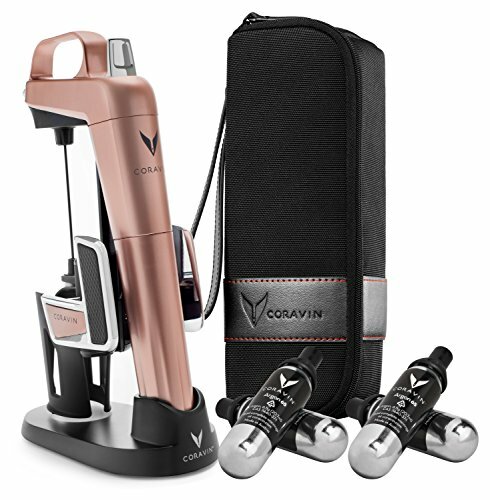 The Model Eleven is the most exclusive Coravin design and comes with multiple premium add-ons. When you order it, you’ll also receive various Coravin accessories. Included are 6 argon capsules, a soft-lined carry case, and a stylish base for easy mounting between uses. You’ll also receive 6 Coravin Screw Caps. These caps allow you to store multiple bottles simultaneously. Wines closed and protected with these screw caps can last up to 3 months after initial opening. To be honest, all Coravin products are a great choice. The quality brand in wine preservation systems is a favorite amongst wine aficionados, restaurants, wineries, and renowned sommeliers. If you’re an amateur wine lover that are simply looking for a functional Coravin wine system without too many frills: Model One seems your best match. Basic yet sophisticated, simple yet sleek. It is the most affordable option that will still be more than sufficient for most consumers. Now, if you want to splurge and love gadgets: Model Eleven might be for you. The most expensive Coravin wine system, it also boasts the most innovative functions. A fancy LED display, automatic pouring: thus is luxury! However, at the very top end of the budget, it will set you back a pretty penny. So, if you only are buying it for occasional, at-home usage, you might not need everything it offers. The mid-range models, the Model Two and upgrade, are a great consensus. These offer more color options, high-end details and an updated silhouette with rubberized grips. We personally love the Model Two Limited Edition Starry Night, as we are suckers for a black and gold color scheme. And it would fantastic on our Instagram feed. All in all, you can’t go wrong with a Coravin. It’s the easiest way to extend your drinking pleasure by weeks or months. If you’re craving a glass, but don’t want to finish an entire bottle: Coravin is the solution. 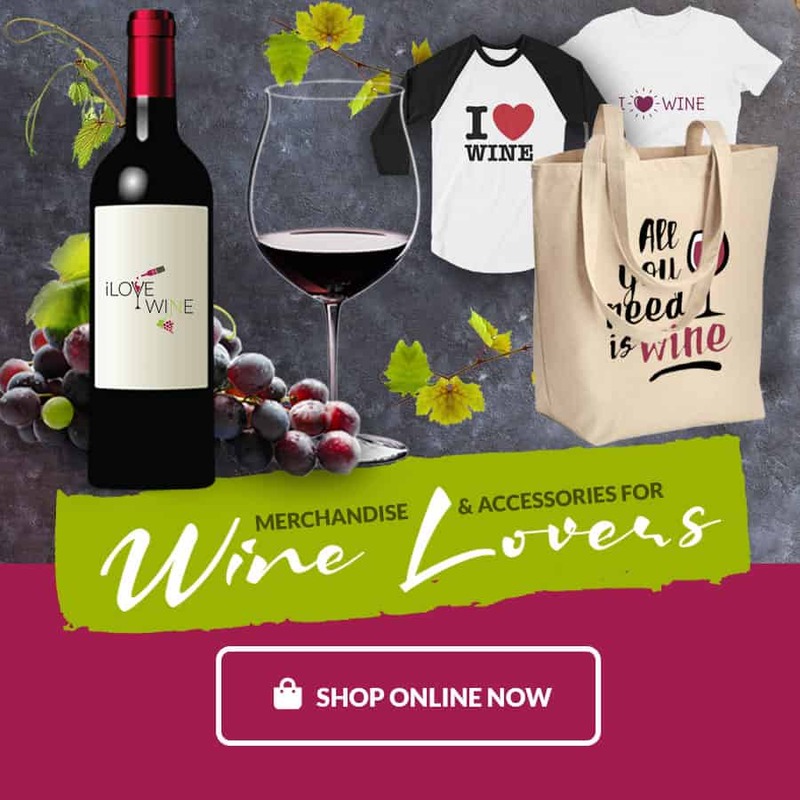 Less wine spoiled means more wine to enjoy, and that’s something that our entire ilovewine.com team wholeheartedly supports! Pssst: Do you need some more help in deciding with Coravin Model matches your lifestyle best? 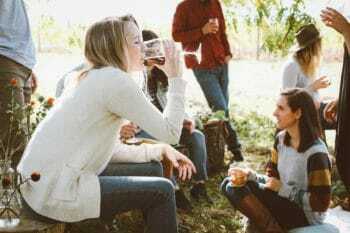 The company has created a special wine quiz, that matches your drinking habits with the perfect model. Use it as inspiration in case you need some more direction in the world of wine preservation systems. Cheers!